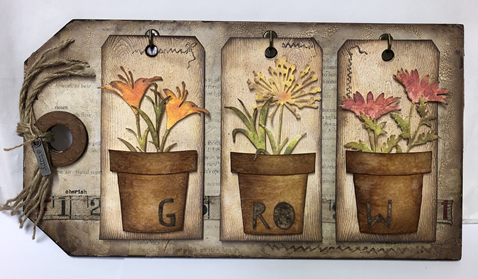 "Grow" your mixed media skills while creating this 6.5” x 12” tag featuring Tim Holtz’s new Sizzix Wildflower Stems dies and Distress Oxide inks. This project uses oxide ink techniques, texture paste, opaque crackle, & embellishments to create layers and texture. Make one for yourself and for your flower-loving friends. Bring Basic Class Kit, craft mat, Multi Medium Matte, paint brush, sanding tool, heat tool, Distress Oxide Inks: Antique Linen & Vintage Photo, Distress Ink: Ground Espresso, blending tool with three foams, fine point liquid glue, water mister, & large foam pop dots. Instructor Bio: Maggie has a real talent working with mixed media! She loves to add layers up layers and always those extra little techniques that make a project say "wow"!